Since day one, the quality of our fabric and production has been the most important element for us. We want to offer the very best to our customers. We create each piece with children in mind, knowing that clothes need to be comfortable, durable, fit well, feel good and most importantly be something that kids have fun wearing. The Angel Wing is Marie-Chantal's iconic signature design, inspired by Marie-Chantal's own children. Our Angel Wings are made from the softest cottons, velours & cashmeres, and are gentle on baby's delicate skin. Our hand drawn logo is named after MC's first born son, Prince Constantine Alexios of Greece. He is our muse & our mascot and we like to keep him close to our hearts. Find him everywhere from our key pieces to our beautiful gift wrapping. 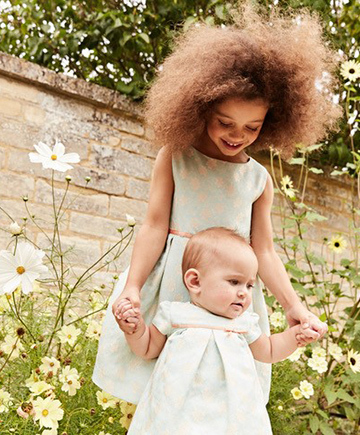 Explore our current & past collections and meet our mini models who bring our beautiful clothes to life with their cheeky smiles. Watch this space: SS17 coming soon!